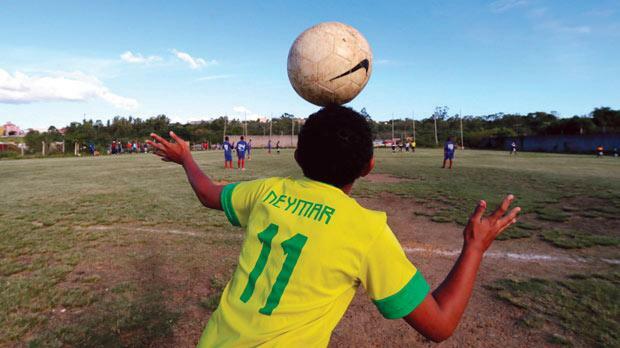 Forget negative stories about unfinished stadiums, Brazil’s national psyche is bathed in football. In this three-part series, Stephen Bailey takes a look at its World Cup destinations, starting with Rio and the southern venues. 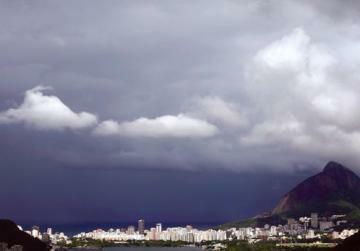 Towering above the city,Christ the Redeemer’s outstretched arms welcome visitors to Rio. The statue gazes down on the city that will host the 2014 World Cup final. Green mountains rise spectacularly from the ocean, dramatic Sugar Loaf Mountain the second of the city’s must-see sights. A seemingly endless roll of white sand curves its way around the bay, famous beaches like Copacabana filled with bronzed beauties and football games. Striking colonial architecture is juxtaposed with modern buildings, the city streets searching for a balance between old and new. Rio is the Brazilian destination that ignites the imagination, the host city that’s likely to be on every fan’s itinerary, regardless of where their team is playing. Move away from the beach and towards the mountains. Nestled on the slopes are the favelas, the slums that evoke Rio’s negative side. According to countless reports and poorly made US documentaries, this is the home of violent crime and a thriving illicit drug industry. 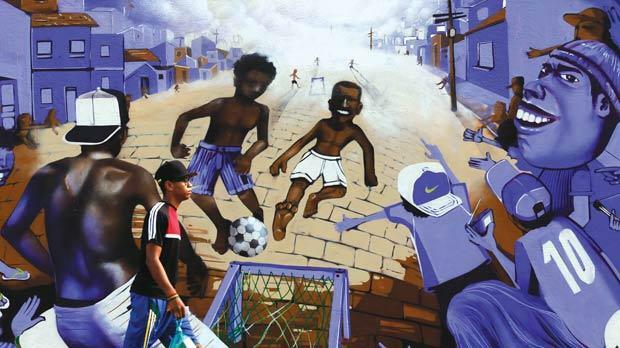 But what would football be without the favelas? Ronaldo, Zico, Romario, Jairzinho... how many beautiful moments have come from the magical feet of players who learned to play on these colourful streets? In a bid to clean up Rio, Pacifying Police Units have been raiding the favelas and declaring them safe for visitors. A tour to one is likely to be as much of a tourist highlight as climbing the steps to Christ the Redeemer. 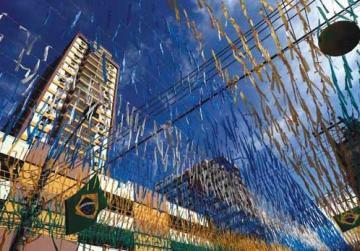 Some companies like Favela Experience have taken the concept further, offering World Cup accommodation there. It promises to be a fascinating insight into genuine Rio culture, although challenging the local children to a game of five-a-side might not be a wise idea. Rio packs in the attractions. Different strips of sand offer serene relaxation, surfing, or unique beach culture. Idyllic mountains and tropical parks combine glorious views and a tranquil escape from the city. Wandering through downtown is an atmospheric journey that integrates 450 years of reverberant history. The redeveloped Maracana is arguably the most famous football stadium in the world, one that once packed in 200,000 spectators. Its new capacity is a mere 75,117, and tickets there are the most sought-after for the whole tournament. As Brazil’s number one tourist destination, Rio promises to be the city that attracts the most cosmopolitan mix of international fans. That could make watching a game at the FIFA Fan Fest on Copacabana Beach one of the highlights of the tournament. Each host city will have a designated fan park, complete with innumerable bars, giant screens, and small-sided local football tournaments. It’s likely to turn even the most mundane of World Cup group games into a barefoot carnival, one interspersed with splashing in the waves and wondering how the local six-year-olds can be so good at kick-ups. If Brazilians are regarded as the most passionate of the world’s football fans, then Rio is the city where this passion is moulded into universal euphoria. When the host nation are playing, the streets will be spookily quiet, every resident glued to a screen that reveals their yellow shirted heroes. The cacophonous, city-wide roar that accompanies every goal will probably induce goosebumps. Much has been made of the locals’ discontent with their government, and its decision to spend so much public money on hosting the World Cup. But that will be immediately forgotten if their team delivers on the pitch. If Brazil can live up to their tag as favourites, then for one magical month, Rio might be the best travel destination in the world. 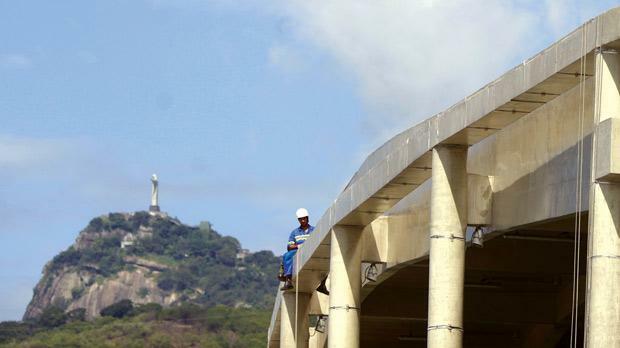 Brazil’s largest city often falls into Rio’s widely-cast tourism shadow. Sao Paulo doesn’t have the same list of enigmatic attractions or postcard-perfect images. At first glance, this is a city that draws unenviable comparisons to the quintessential concrete jungle, but the infectious energy of the streets, and the city’s enduringly youthful character, make Sao Paulo a place that gradually grows on every visitor. If Rio is for posing and enjoying being a tourist, then this is a city for meeting the locals and spending three days with random strangers. By Brazilian standards, Sao Paulo is close to Rio. That means that a bus journey takes seven to eight hours. A brand new stadium will host the opening match and one of the semi-finals, but it’s still not finished. Some of the temporary stands have not yet been installed and the official unveiling isn’t scheduled until just before Brazil and Croatia kick off the tournament. This embarrassment could be seen as emblematic of Sao Paulo, a city marked by corruption and a huge disparity between rich and poor. However, in one of the world’s most populous cities there certainly won’t be a shortage of screens relaying the action, and the concentration of downtown bars should make for some memorable all-night post-match partying. Red carpets welcome those with money to plush nightclubs, many displaying an opulence that could rival anywhere in the world. When football comes off the agenda, take an elevator up one of the city’s skyscrapers for glorious views that extend to the surrounding Atlantic Rainforest and ocean, or relax in one of the city parks. But the highlight is likely to be the locals. 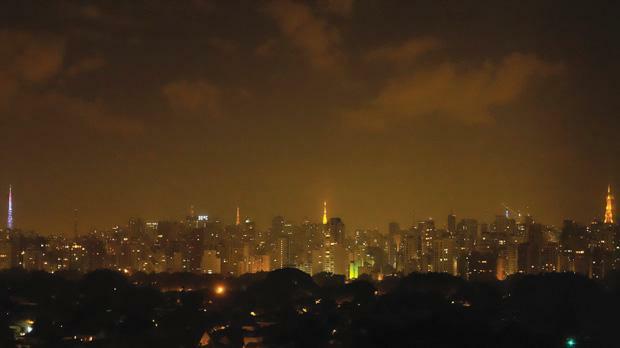 Rich or poor, young or old, Sao Paulo offers a genuine side to Brazil that isn’t corrupted by tourism. Peel away from Rio and peer past the concrete, because Sao Paulo could be one of Brazil’s most underrated destinations. The stunning Iguazu Falls are 10 hours by bus from Curitiba. 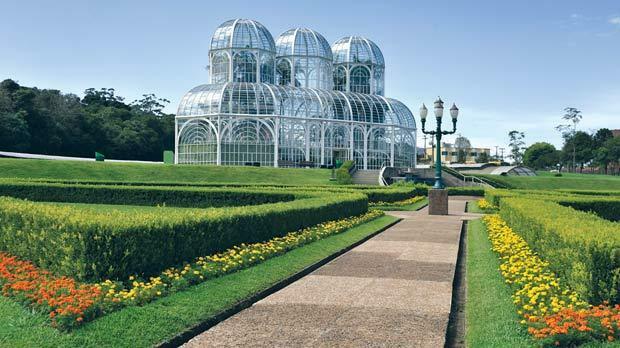 A further six hours down the Atlantic Coast, Curitiba is one of the continent’s most affluent cities. It showcases the modern future of Brazil, a city that’s all about glass-fronted skyscrapers, responsible urban planning and eliminating poverty. After the jam-packed streets of Rio and Sao Paulo, Curitiba could provide a gentle place to unwind and catch your breath. Only four games are scheduled to be played in Curitiba and they aren’t the most inspiring. Even the most passionate of fans will struggle to get excited about watching Iran play Nigeria or Algeria face Russia. Its attractions include a collection of fountains, botanical gardens and well-preserved colonial architecture – again, not the most inspiring – but the city’s trump card is that it’s the gateway to the majestic Iguazu Falls. 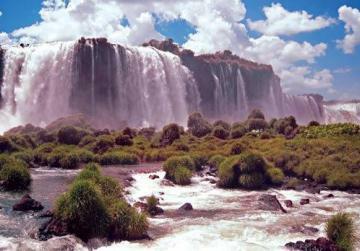 Falling between Brazil and Argentina, the falls are one of South America’s standout natural wonders. Watch monumental spray create 360º rainbows and marvel at a narrow gorge that’s consumed with rising mist. Taller and double the width of Niagara Falls, Iguazu Falls offers a natural halftime to football and fan parks. They are 10 hours by bus from Curitiba, but it’s a journey that winds through rich rainforest and is done by a number of luxury tour companies. If that sounds a little hectic then book a local flight before they sell out. 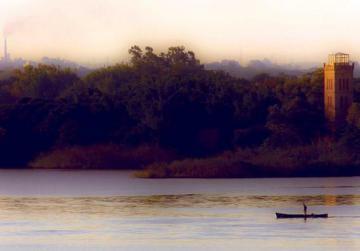 A man fishing at sunset in Porto Alegre. 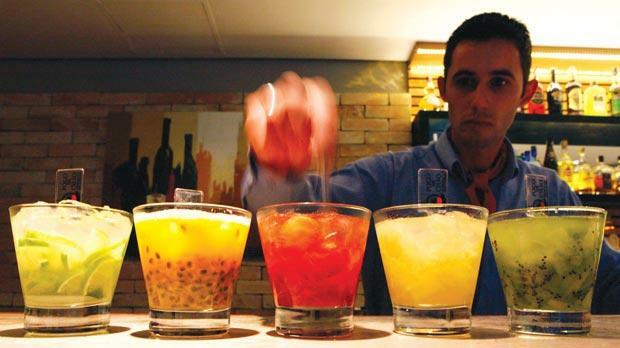 Brazil’s southernmost host city has a different atmosphere to the rest of the country. Sharing cultural similarities with Argentina and Uruguay, Porto Alegre offers an entirely different perspective on Brazilian city life. This is a city where steaks are weighed in kilos, Argentinian mate tea replaces coffee, and sipping wine is an obsession. Situated on the Guaiba River, the must-do experience is taking a boat out at sunset. Prosperous and proud, this city should have been the last to have problems with its stadium. But in March, its mayor said the city’s participation could be cancelled if companies were not given tax breaks in return for additional financial investment. That was a major embarrassment, given that the locals give off a boastful whiff of being superior to the rest of the country. As the city faltered in its preparations, the rest of Brazil turned a blind eye; having a sense of independence from the rest of the country has its pitfalls. France and the Netherlands both play matches here, but the most intriguing date will be June 25, when Argentina come to town. Their match against Nigeria could reveal how far the city’s culture has swung to its western neighbour. Geographically, Porto Alegre is not easily accessible. It’s over 1,500km from Rio, and arriving by plane looks to be the only feasible option. But first-timers to South America could visit four different countries if they venture down to this corner of the continent. Buenos Aires, Paraguay, and Uruguay could easily fit into a short itinerary. For non-football crazy visitors, Porto Alegre can offer a glimpse of the World Cup while exploring elsewhere on the continent. Visitors who don’t understand the intricacies of the offside rule should remember one name: Ronaldinho. The overhead kick-loving, former world player of the year is Porto Alegre’s most famous son. One mention of his name will bring a smile to the face of any local.